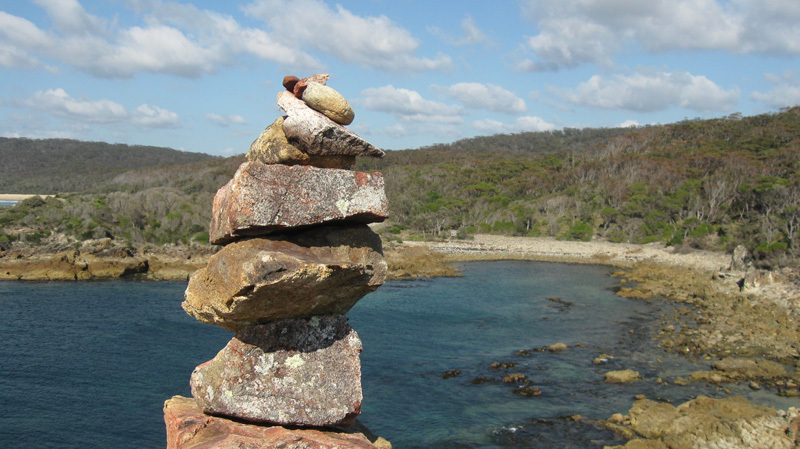 I built this rock cairn in a stony gully next to where I’d camped for a couple of days. A pleasant little spot, though definitely only for when no rain is expected. A little pretentious to build a cairn to mark my own camping spot, though that feeling was tempered by building it in the gully since it wont survive the next downpour of rain. Of course in Canberra that may not be for months. Rock cairns are often a little pretentious really. I’m thinking particularly of the tendency to build a cairn at the top of a mountain, as if we think we are bettering nature just because we built a little pile of stones on top. On the positive side it’s a nice little ritual to add your one stone to an existing cairn, playing your part in the maintenance of a cultural mark on the land. Of course the balance between nature and culture has shifted somewhat the last couple of centuries. Still, it is fun to build a pile of rocks so maybe I shouldn’t try to think about it so much. I’d been thinking about territory and access to land – the implications of “ownership” and the circumstances of being excluded from ownership. Being in a National Park is the nearest I can get to legally rightful access to land right now. Then I came across these markers (and others like them) while I was out in Namadgi lately. Exactly what they mark and for who I do not know. They mark a walking route yes, since I was following a worn footpad at the time, but it is not actually a National Parks walking track as such, and not really the way to anywhere in particular – other than the sort of semi-random ramble I was doing. Do they mark something else of significance to someone? Was the footpad created by someone checking on whatever the markers indicate? What was also interesting was that if you know a little of the recent history of the site then there is a clear marker of time in the paired old and new stakes – obviously before and after the fires of 2003 that devastated much of this region. A little earlier I had climbed a hillside up away from the river, then kind of suddenly decided the days’ exploration had reached it’s zenith and it was time to turn about and angle back towards where I had started. I sat on a log to rest a while and just as suddenly thought I should build a cairn of sticks – not initially really sure why. I’d been looking at Richard Long and Hamish Fulton books you see. I think I was marking “territory” – the furthermost point I had so far reached in this part of Namadgi. Thus part of my personal “territory” – even if I was the only one who knew it.